Please log on to your parent portal and accept all new Rules and Policies. If you do not know how to log on to your parent portal, please see us in the office. We will give you the tablet to log on and read and accept them or we can get your account set up for you. You will need to accept 2019 rules and policies by Feb 1st. REGISTRATION FEES: All members are required to pay a registration fee of $35 at start of classes and annually. The family registration fee is $60 at start of classes and annually. SUMMER: Any student that is not a member of Tumble Tots and Teens may attend Summer Camps. Clinics and Classes have applicable summer registration fees. 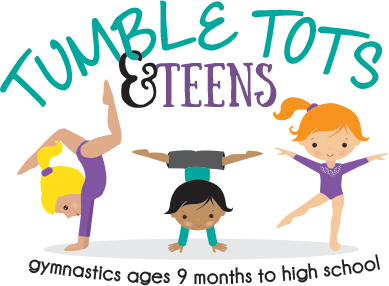 Summer fees entitle you as a member of Tumble Tots and Teens for the months of June – August ONLY. This will make them a member of Tumble Tots and Teens for the months of June-August ONLY. If your child chooses to continue after summer months, you will need to pay the yearly registration fee, this fee is separate and good for 12 months from enrollment. Summer Registration fee will be $15.00 per child or $25.00 for the family. OUR GYMNASTICS PROGRAM DOES RUN YEAR-ROUND! If you choose not to attend summer months, you must log on to the parent portal and submit a drop request at least 2 weeks prior to your drop date. Summer classes will begin June 4th, 2018. During the Month of May, we will be emailing evaluation certificates for the members who have passed their current class level. At that time, you will receive notification if your class will change in day and or time. If you choose not to stay enrolled for Summer classes, then your child will remain at the same level and will have to be re-evaluated upon returning to class. Pro-rated Months: Tumble Tots and Teens will pro-rate any of your summer month’s tuition with a written note to office. If you would like to do make-ups classes you can, but you will need to make them up during the summer months. PRO-RATED TUITION ONLY APPLIES TO THE SUMMER MONTHS. Camp Guidelines: All Summer Camps will be on a sign up bases and must have at least 5 participants signed up to hold class. If we do not have 5 signed up we will cancel the camp. If you are not signed up, we would not be able to contact you about camp cancellation. Tumble Tots and Teens will provide snack for all camps. Your child will need to bring a bag lunch to camp daily. Also, a towel, swimsuit and a change of clothes for water camps. Water days will be specified in each camp description. We will offer a discount on the 2ndchild if you have more than 1 wanting to attend.